Continuing on from the Petrov line that Burgess' The Mammoth Book Of Chess tells us is best for Black if the White pawn is taken on move 3 are these two lines of play from I.A. 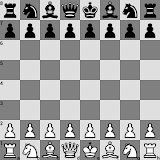 Horowitz's Chess Openings. We're warned that Black taking the pawn "is bad". 1. e4 e5 2. Nf3 Nf6 3. Nxe5 Nxe4 4. Qe2 Qe7 5. Qxe4 d6 6. d4 Nd7 7. Nc3 dxe5 8. Nd5 Nf6 9. Nxf6+ gxf6 10. Bb5+!